I’ve been building these for 3 years. The lead time on this item is roughly four weeks. There is a line. Speedometer not included (used for reference). Modern ATC /ATO fuse block. Custom fabricated by hand individually. Now all SXL grade wire! Plus, the main 10 gauge power feed is now marine grade tinned wire! This harness fits a 14 inch chopped pan dune buggy. If you have a full pan buggy check my other listing. We call it The original VW Dune Buggy Plug and Play harness. Instructions and schematic included. More than 90 solder points. (Mostly terminals and some internal junctions). Cleanly wrapped so your install looks great! Here’s some you tube videos walking through each part. Connectors are 95% female slide connectors, all properly soldered and shrink wrapped. These are custom built one at a time to order. I will need to know. Will you use an old school foot switch for your hi-beam, or the turn stalk switch that uses a solenoid? Does your trans axle has a reverse switch on it? Not sure about your states laws regarding reverse lights. I have had to wire for a toggle switch to actuate reverse lights in the past. If it’s IRS then it has the switch. Most old swing axle ones don’t have it.. Old style large numeral, or newer 70′s with electric fuel gauge inside? Finally, will you use a newer AL82 type internally regulated alternator, or an external voltage regulator, with an AL 78 alt, or generator? Please specify where your harness needs special terminations. Commonly, aftermarket ignition switches have screw posts, not plug-ins. This is default as most buggies use aftermarket ignition switches. 250 side-in connectors are the default connector, so let me know if you need something else. Male spade plugs are used where necessary for stock VW components like: wiper motor ground, turn signal leads to column, and. Plugs right up to YOUR stock beetle speedometer, headlight switch, turn lever, tail lights and wiper switch! Some “universal” kits are lacking important items. Your harness includes all grounds for a fiberglass bodied VW. 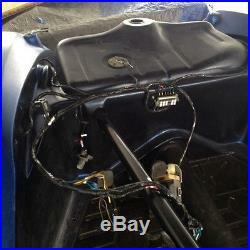 Your new harness will include fuel gauge wiring and sending unit leads with ground. (Electric fuel gauge) specify if you use a mechanical fuel gauge (light). Your new harness will include wiper leads for a 12v VW 2 speed wiper assembly. 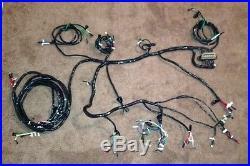 Your new harness will include leads for a stock Vw turn signal assembly. With or without dimmer. Or a foot operated dimmer setup. Your harness will have light leads and grounds to all gauges if any. What year is your pan? Reverse switch in nose cone of transaxle? Your harness will be wrapped in dry vinyl harness wrap that is similar to electrical tape but has no glue and must be tied on ends. It is the standard for all late 60′s 70′s cars. It can be unwrapped and re-wrapped if necessary to modify or adjust. Simple to unwrap, tie off like a balloon. Does your buggy have harness tubes molded in? We prefer to use the left side of the buggy body for harness wiring. The right side for you to install radio speaker wires and stuff like off-road lights at a later date. Default location of our front-to-rear harness is always drivers side under fender ledge or through body tubes. Specify if your harness needs to run down the PASSENGER SIDE OF BODY or FLOOR PAN ROUTING. Do you have a newer internally regulated alternator? Do you run an external voltage regulator? Where is it in the engine bay? You might need to relocate it. It’s usually found in backseat of bugs, typically relocated on buggies to top of or side of doghouse passenger side. Dash speedometer and switch location should be included in communication so the dropouts will be where they need to be. Default location is the typical cluster in the center of dash. Some buggies have a headlight switch installed on the left of steering wheel… Specify if yours is unusual. T BUGGIES FOOT WELLS ARE WAY DIFFERENT. FUEL TANK LOCATION is critical if you have an electric sending unit in it and a gas gauge in the speedo that you want to work. Most aluminum tube style tanks have no device for measuring, so if that’s how you roll, skip this step!!! Otherwise a lead from gas gauge to tank must be fitted to your custom/remote fuel tank if it has a sending unit in it. Default location is with a stock VW TYPE 1 tank under the hood as found in most buggys. I need to know exactly where it is. High beam, low beam, front and rear turn signals, horn, rear running lights, stop lights, reverse lights, reverse lead in, lisence plate light. Gnition switch, headlight switch, dimmer switch (floor mounted), wiper switch/ motor, turn signal switch, flasher, Tach, speedometer, high beam indicator, oil pressure indicator, Turn signal indicator, coil indicator and heavy accessory lead. Wiring for fuel tank sending unit and electric gauge. Also starter and alternator leads. All with respective grounds for a fiber-glass bodied vw car. Also, a modern, sealed, 6 circuit Fuse box. Sorry, no truck / sportsman bodies available for test fit, but we can help you make it happen with proper communication, pics, and a few measurements! These will be custom built for you on a first come first served basis. There IS a line. They are’built to order’ by hand in the US of A and will require time to fabricate. Please plan ahead- thanks for your patience. RHD Right hand drive is available. I have been doing electronics and wiring since 1984. Satisfaction is my goal. Oh, and to rid the world of ugly wiring in cool cars! Vw volkswagen type 1 Meyers manx glitterbug deserter el-lobo coyote BC bee joe poty Empi imp sand winder rascal manix etc. 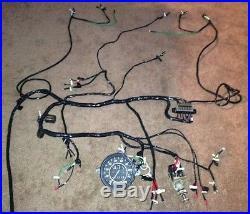 The item “VW Dune buggy Wiring harness! Plug and play Meyers manx 14 1/2 chopped pan” is in sale since Monday, February 27, 2017. This item is in the category “eBay Motors\Parts & Accessories\Car Electronics\Installation Products\Wire Harnesses\Aftermarket Harnesses”. 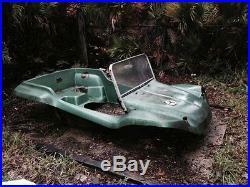 The seller is “dunebuggybros” and is located in Fernandina Beach, Florida. This item can be shipped to United States, Canada, United Kingdom, Denmark, Romania, Slovakia, Bulgaria, Czech republic, Finland, Hungary, Latvia, Lithuania, Malta, Estonia, Australia, Greece, Portugal, Cyprus, Slovenia, Sweden, Belgium, France, Ireland, Netherlands, Poland, Spain, Italy, Germany, Austria, Mexico, New Zealand, Switzerland, Norway, Ukraine, Croatia, Brazil, Chile, Colombia, Costa rica, Panama, Trinidad and tobago, Guatemala, Honduras, Jamaica.